If you’re looking to improve your marketing skills, get started with social media or ensure you’re up-to-date with the latest best practice examples, you can learn with me online or as part of a small group workshop. Whenever you’re learning or working with me, you’re in safe hands. I am a Fellow grade member of the Chartered Institute of Marketing (FCIM), have achieved and maintained Chartered Marketer status each year since 2012. This means I have made a commitment to keep my professional skills up-to-date and that I comply with a professional code of conduct. I am a course instructor for LinkedIn’s online learning platform, an accredited trainer for Facebook and Instagram (as part of their #shemeansbusiness campaign) and a coach for Google’s Digital Garage initiative. 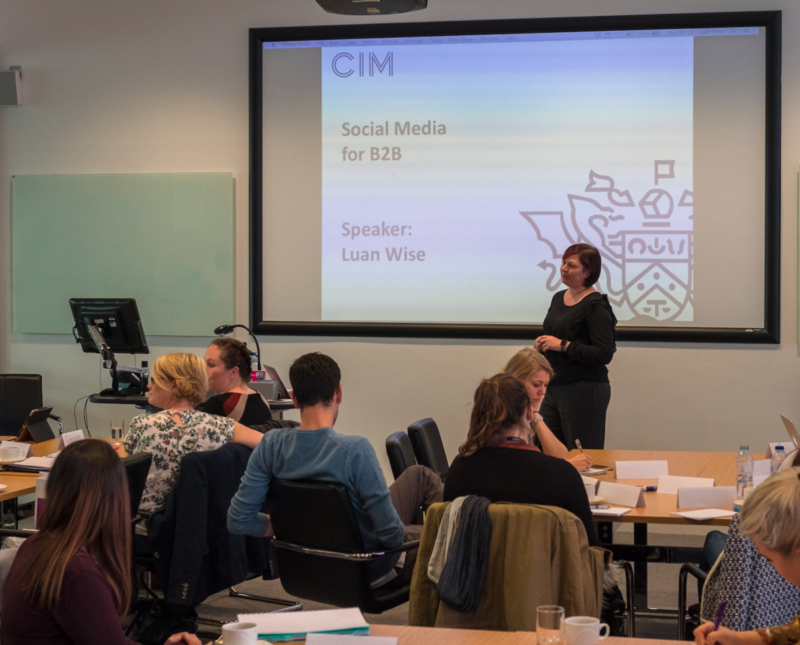 I have run workshops for the Chartered Institute of Marketing (CIM), the Chartered Institute of Management Accounts (CIMA), the Chartered Institute of Personnel andDevelopment (CIPD), the Chartered Management Institute (CMI) as well as in-house courses for universities and colleges. Want to know more about me? Go here. Everything I share within a workshop is grounded in theory as well as practical experience, continued learning (I’m an avid reader and information junkie) and from knowledge gained by speaking to hundreds of business professionals. I’m a practitioner that likes to talk, not a lecturing academic. Every session is interactive – I listen as much as I talk, and manage the session to ensure that everyone leaves with action points to help them achieve their objectives (we always finish on time too). Each month I host a free webinar for IPSE, the Association of Independent Professionals and the Self-Employed. To register, visit the IPSE website. I have the following courses currently available on LinkedIn Learning. Courses are free to access if you have a LinkedIn premium account. I run the following courses at Gloucestershire College. To book your place contact Student Services on 0345 155 2020. Download this document for full course details. Established in 2004, B2B Marketing is now the number one go-to resource for B2B marketers across the globe. I run their open training course, ‘How to write a marketing plan’. To find out more and book your place, visit the B2B Marketing website. These LinkedIn masterclasses are being hosted by the Chartered Institute of Marketing (CIM), South East. Booking details coming soon. #SheMeansBusiness is a global Facebook program that provides training for business women who want to gain new skills to start, grow or scale their businesses, with the aim of creating a community of business women where they connect, inspire and help each other to find success. As an accredited trainer, I am hosting the following events at The Queens Hotel, Cheltenham.